On the 30th January, the Governor General of Australia, the Queen's Representative in Australia, was presented with his PJM at a formal ceremony in Canberra. The event was recorded on the web site of the Australian Department of Defence. The article and the photograph of the presentation group are set out below. His Excellency Governor General Major General Michael Jeffery is an Australian citizen and so has the Queen's formal permission to wear his medal. We shall not take the opportunity to make any point here, only to say that the Australians have behaved impeccably in relation to the PJM and have shown the British Establishment that diplomatic table manners flourish in their country whilst our HD Committee and Government persist in eating their Privileged peas off their Imperial knives. It is heart-warming to see next of kin receive with pride their relative's posthumous medal. In 2004, the Malaysian government offered Australia the Pingat Jasa Malaysia (PJM) to commemorate those Australian Defence Force personnel who served to uphold the sovereignty of Malaysia during the Malayan Emergency and the Indonesian Confrontation between 31 August 1957 and 31 December 1966. The Australian government accepted the offer and over 6 000 applications have since been verified by Defence out of about 12 000 former and current serving members believed to be eligible. 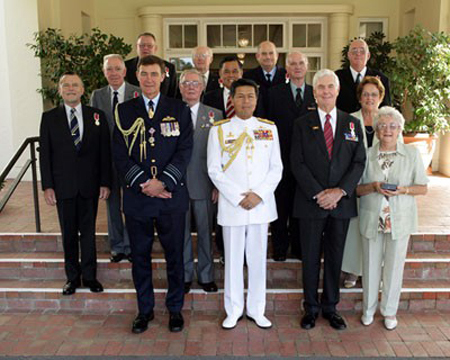 On Monday, 30 January 2006, the Malaysian Chief of Defence Force, Admiral Anwar attended Government House, Canberra to present the first awards of the PJM. As a sign of good-will, Admiral Anwar presented the initial medals to the Governor General, Major General Michael Jeffery AC, CVO, MC, and to veterans across a range of ranks and Services who served in the Malayan Emergency and the Indonesian Confrontation. The medal was also posthumously awarded to two veterans and presented to their next of kin as a mark of honour to all deceased veterans. Visiting Malaysian Defence dignitaries were present at the award ceremony, accompanied by Chief of Defence Force Air Chief Marshal Angus Houston, AO, AFC and invited guests of the medal recipients. The original intention was for the medal to be presented individually at small ceremonies around the country, and in Malaysia to visiting Australians. However, this is now no longer possible. Distribution to remaining eligible recipients will now be through the Directorate of Honours and Awards from within Defence, acting as agent on behalf of the Malaysian Government. This process is expected to commence in the near future. The Department of Defence will receive applications, verify the service and eligibility and facilitate the approval to wear the award in accordance with guidelines for foreign awards. Back L-R: Corporal Robert Tyrrell; Air Commodore Albert Benson; and Warrant Officer Geoffrey Dorward. Middle L–R: Seaman Deric Kenyon; Commander Colin Fitzgerald; His Excellency Dato’ Haji Salim Hashim, High Commissioner for Malaysia; Warrant Officer Class Two Robert Brown; and Sergeant Eric Johnston. Front L-R:Lieutenant Colonel Tomasz Ciesniewski; Chief of Defence Force Air Chief Marshal Angus Houston; Malaysian Chief of Defence Force, Admiral Anwar; His Excellency Governor General, Major General Michael Jeffery; Mrs Jennifer Burns; and Mrs Elaine Neeves. The above article and photograph are attributed to the Australian Government - Department of Defence and the original article can be viewed at http://www.defence.gov.au/dpe/ (click on the Honours & Awards button). Comment=Govenor General of Australia, Major General Micheal Jeffery AC CVO MC, the Queen's representaive in Australia, received his PJM from Malaysian chief of defence forces Admiral Anwa, Jan 2006 Government House, Canberra. Good luck lads, wear it with pride.